Grows in full sun, trim regularly for best shape - and have fun! Ligustrum, or 'Privet Laurel', is the absolute gold standard in topiary and standard form trees and shrubs. The exceptionally small and tight growing leaves create a dense network of stems, making for easy cutting and shaping. 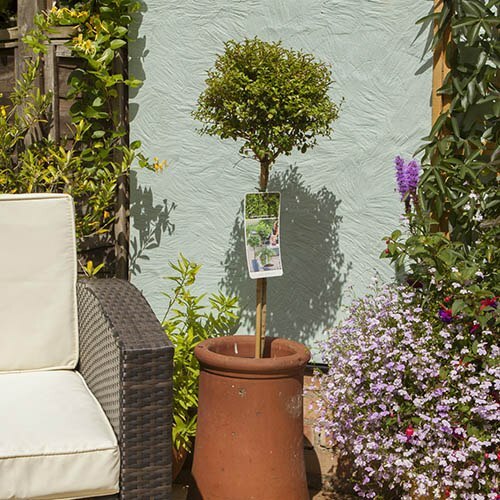 Ligustrum, in fact, form the basis of the most exotic and stunning topiary creations, yet also make wonderful standards, lollipops and globes too, as a better alternative to Box (Buxus). Very forgiving of all weathers, they may lose an odd leaf in coldest winters, but recover quickly in spring. Trim regularly in growing season, or allow them to grow a little and they will produce sweet scented cream flowers, followed by berries. Perfect in pairs aside doorways, gates and paths, or allow them to grow and get creative and make your own shapes too. Supplied in a 3L pot, a standard lollipop form tree, with a clear 50cm stem, and trimmed head 20-25cm diameter, 1M tall inc pot.